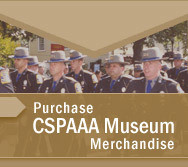 To make a tax deductible donation download the CSP Museum Donation Form. The CSPAAMEC is a 501 (C) (3) organizataion. Your donations are greatly appreciated. To donate memorabilia currently included on our Wish List, please send your information (including a description of the items you wish to donate) via our online contact form. A volunteer will coordinate drop off or pick up of your donated items. If you wish to donate an item that is not currently being sought by the Connecticut State Police Museum & Educational Center, please contact us via online form or telephone (203.440.3858) to determine if we will be able to accept your donation. Due to the sheer volume of inquiries we receive, we restrict unsolicited donations to those that are in good condition and are able to be accommodated by our current storage space.